[Tuesday, 30 September 2015 –Osenase, Ghana 1100 GMT] — Our team is doing well while here in Ghana. Each member has accepted his assignments with grace and determination. Each morning, Jeff Andler, Dave West, and I conduct several school assembly programs – each in separate and distinct villages around the area. The schools have ranged, in size, from eighteen to nearly 1,000 students. In every place the gospel message is preached with clarity and simplicity. Day-by-day we are humbled, but not surprised, at the outpouring of the Holy Spirit in drawing individuals into relationship with Jesus Christ. 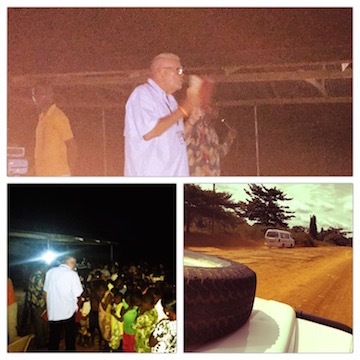 Nightly, team members Craig Barker, Mark Chase, and James McLean, are met by our Ghanaian partners and transported to three different villages for the evangelistic presentation during the screening of the Jesus Film. All in all we have been allowed to share the Gospel in 137 different venues to an estimated audience of nearly 34,000 individuals. This is certainly the absolute sovereignty of God. The expected challenges continue to exist. We have intermittent electrical service, bad roads, seemingly ill prepared schedules, and the occasional bout with a culture of dishonesty and deception, but through it all God remains faithful. There are three film crusades scheduled for tonight. Please pray for safety in travel, a clear sky, and an audience to respond to the Gospel.